John Rain has returned. New York Times bestselling author Barry Eisler has crafted a new thriller featuring his popular protagonist that is impossible to put down. Perhaps the most exciting entry to date in the Rain series, The Detachment brings a mixture of elements together which provides more action that any James Bond film can boast. When John Rain is approached by former black ops veteran Colonel Scott Horton, with the notion of bringing about the demise of a trio of powerful players who are getting ready to launch a coup in America, Rain cannot resist the promise of a million dollar payday, or the challenge that comes with carrying out three assassinations that must look like “natural” deaths. In order to carry out the assignment, Rain finds himself teamed with Dox. Ben Treven, a partner who has his own agenda on the side, and the shadowy Larison, whose own motivations are far from objective and potentially lethal to more than just the targets which he’s been hired to eliminate. Spanning the globe from Tokyo and Los Angeles to Vegas and Austria, the team sets out to complete their mission – a detachment of individuals working together but for their own varying reasons. 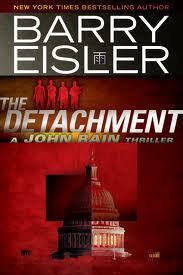 Having been an Eisler fan for many years, The Detachment stands as one of those novels which takes you on a ride that will leave you breathless, giddy, and terrified at times, but undeniably wanting more from Barry and John Rain. And in true form, I’ve a feeling that both will keep delivering for a long to come.